Astronomers have used ESO’s Very Large Telescope, along with radio telescopes around the world, to find and study a bizarre stellar pair consisting of the most massive neutron star confirmed so far, orbited by a white dwarf star. This strange new binary allows tests of Einstein’s theory of gravity — general relativity — in ways that were not possible up to now. So far the new observations exactly agree with the predictions from general relativity and are inconsistent with some alternative theories. The results will appear in the journal Science on 26 April 2013. This pulsar is named PSR J0348+0432 and is the remains of a supernova explosion. It is twice as heavy as the Sun, but just 20 kilometres across. The gravity at its surface is more than 300 billion times stronger than that on Earth and at its centre every sugar-cubed-sized volume has more than one billion tonnes of matter squeezed into it. Its companion white dwarf star is only slightly less exotic; it is the glowing remains of a much lighter star that has lost its atmosphere and is slowly cooling. Einstein’s general theory of relativity, which explains gravity as a consequence of the curvature of spacetime created by the presence of mass and energy, has withstood all tests since it was first published almost a century ago. But it cannot be the final explanation and must ultimately break down . Physicists have devised other theories of gravity that make different predictions from general relativity. For some of these alternatives, these differences would only show up in extremely strong gravitational fields that cannot be found in the Solar System. 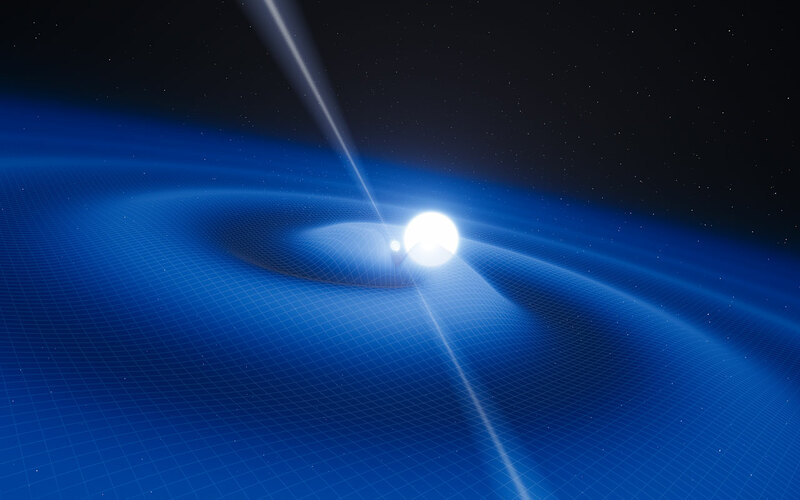 In terms of gravity, PSR J0348+0432 is a truly extreme object, even compared to the other pulsars that have been used in high precision tests of Einstein’s general relativity . In such strong gravitational fields small increases in the mass can lead to large changes in the spacetime around such objects. Up to now astronomers had no idea what would happen in the presence of such a massive neutron star as PSR J0348+0432. It offers the unique opportunity to push tests into new territory. General relativity is not consistent with the other great theory of twentieth century physics, quantum mechanics. It also predicts singularities under some circumstances, where some quantities tend to infinity, such as the centre of a black hole. This research was presented in a paper “A Massive Pulsar in a Compact Relativistic Orbit”, by John Antoniadis et al., to appear in the journal Science on 26 April 2013. The team is composed of John Antoniadis (Max-Planck-Institut für Radioastronomie [MPIfR], Bonn, Germany), Paulo C. C. Freire (MPIfR), Norbert Wex (MPIfR), Thomas M. Tauris (Argelander Institut für Astronomie, Bonn, Germany; MPIfR), Ryan S. Lynch (McGill University, Montreal, Canada), Marten H. van Kerkwijk (University of Toronto, Canada), Michael Kramer (MPIfR; Jodrell Bank Centre for Astrophysics, The University of Manchester, United Kingdom), Cees Bassa (Jodrell Bank), Vik S. Dhillon (University of Sheffield, United Kingdom), Thomas Driebe (Deutsches Zentrum für Luft- und Raumfahrt, Bonn, Germany), Jason W. T. Hessels (ASTRON, the Netherlands Institute for Radio Astronomy, Dwingeloo, The Netherlands; University of Amsterdam, The Netherlands), Victoria M. Kaspi (McGill University), Vladislav I. Kondratiev (ASTRON; Lebedev Physical Institute, Moscow, Russia), Norbert Langer (Argelander Institut für Astronomie), Thomas R. Marsh (University of Warwick, United Kingdom), Maura A. McLaughlin (West Virginia University), Timothy T. Pennucci (Department of Astronomy, University of Virginia) Scott M. Ransom (National Radio Astronomy Observatory, Charlottesville, USA), Ingrid H. Stairs (University of British Columbia, Vancouver, Canada), Joeri van Leeuwen (ASTRON; University of Amsterdam), Joris P. W. Verbiest (MPIfR), David G. Whelan (Department of Astronomy, University of Virginia).